As you fellow bloggers are probably aware, feelunique.com had a little offer on their website over the last few days, where if you spend over £60 on selected beauty products you get a 20% discount. I’ve been wanting to treat myself to a few little bits and bobs, including the Lancôme foundation that I trialled and reviewed in one of my previous blogs, so I thought this was the right time to buy! Obviously, I got myself a bottle of the Lancôme Teint Miracle Bare Skin Perfection Foundation in the colour Beige Porcelaine. It’s normally £30 but with 20% discount I got it for £24, which isn’t much more expensive than my normal No.7 foundation so I’m quite happy with that one! I then bought myself a few little Yves Saint Laurent goodies. 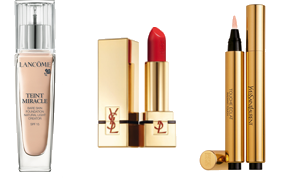 Living in France has been quite difficult for me as a makeup lover, and especially as a lipstick lover, because there are YSL counters everywhere- in Sephora, in the department stores, in some supermarkets and even in pharmacies. I’ve been finding it really difficult to resist so thought with this little discount it was the right time to treat myself to some of the things I’ve been eyeing up all year. The first thing I bought was their Rouge Pur Couture Lipstick in Rouge Roxanne. I loved the colour and it was MUCH cheaper buying it online (even without the discount) than getting it on one of the French counters so I really couldn’t say no!! It cost £26 without discount, so £20.80 with the discount added. My final purchase was the acclaimed Touche Éclat Highlighter- I got the original one as I wasn’t sure what shade I’d need in this as I’ve never actually sampled it before. This one seems like a staple makeup product for most bloggers so I thought I’d give it a go. It was £25 (so £20) which isn’t too bad really. I recently lost my entire makeup bag in a train station (and had to repurchase practically everything) and hadn’t got hold of a highlighter yet so this will have to be my replacement. I’m going to do a little review of the three products when I receive them and I’m very excited to see if they’re worth the pennies!! Have you ever used any of these products? What do you think of them? ?